1. Display: You can pick how many entries to show per pages. If 50 and 100 are no problem we strongly suggest avoiding selecting the ALL function for big competition, it may take quite some time to load! 2. Search (NEW): there’s now a quick search field. 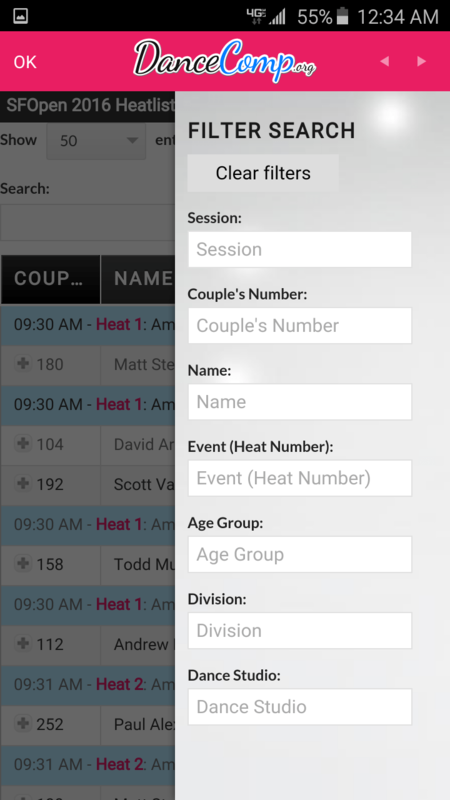 Type whatever name, heat number, couple number, event name to search through all entries and display the relevant ones. 3. Search Filter: The Magic starts here! Read Below. You can choose to filter through the list to look for the info you want. Want to get all your entries? Simply type your name in the Name field and tap on the left side of the screen (the dark out part) to go back to the list: tada! All your Heat and their time are now displayed. You can also simply type your or your partner’s Number. Are you competing Pro/Am and your teacher has several students? Type his Number on the Couple’s Number Field and the first few letter of your name in the Name Field, you now have all your entries and time. Let’s admit it, many like to see who they are competing against… Use the Event (Heat Number) Field to display the Event of your choice. Tip: type HEAT then the Number of your choice for a better search. You can also type Pro Heat followed by the number of your choice (or not, to get all pro heats) to see the listing of couples in a professional event.